Finally sober, St. Andrew’s College graduate Jack Lerade, dismisses NSW Captain Steve Smith with an ‘unplayable zooter ball’. Captain Steve Smith with an ‘unplayable zooter ball’. A 55-strong crowd poured into the Sydney Cricket Ground and tussled unnecessarily for priority seating last week to watch Kirribilli’s B-grade side clash with the NSW Blues. Kirribilli were the winners of a road safety competition run by the NSW Government encouraging young drivers to take a pledge against speeding. Their winning entry proffering the message that ‘it is better to be five minutes late than lose a mate’ to speeding. NSW appeared to view the 20/20 fixture as an ideal opportunity for under-performing batsmen Phil Hughes and Usman Khawaja to reinstate themselves in the minds of national selectors. This was irrespective of no national selectors being in attendance at the fixture. 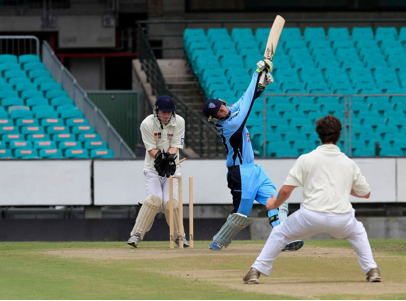 Kirribilli, who boast the perplexing nickname ‘the Thrill Billies’ despite usually playing an unimaginative brand of park cricket, sent NSW in on a green-tinged SCG wicket. After Khawaja fell for 27, Hughes survived multiple early scares to finish joint top-scorer with 48 not out, while Steve Smith (48) was also influential in propelling NSW to 4-183 after their allotted 20 overs. In reply, Kirribilli struggled to handle the searing pace of former Australia-star Nathan Hauritz, before captain Steve Smith spun his way through the middle order, claiming 3-8 as Kirribilli crumbled to be all out for 86 in the 16th over. Amidst the excitement of the fixture, the day’s message about speeding wasn’t lost. “Our captain for the day, Marc Harrold, recited his heart-felt slow down pledge which inspired us greatly. Our team managers, Rory Williams and Sam levy just told us to keep our heads down – Rory says that a lot,” he said.